What in the world is a paw-paw? 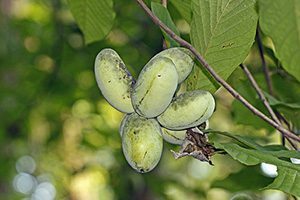 Paw-paws (Asimina triloba) are America’s forgotten fruit. These trees with mango-like fruits can be found throughout moist woods and along streams in Maryland. There are even a few local farms that grow paw-paws! Paw-paws are small trees in the apple-custard family (Annonaceae). They can grow up to 35 feet in height and often have trunks that measure 8-12 inches in diameter. In the spring, maroon flowers dot the twigs before leaves emerge. The flowers, while gorgeous, pack quite a stench intended on attracting beetle and fly pollinators. Soon, the leaves will emerge, growing up to 12 inches in length. Paw-paws grow best in slightly acidic soil (pH 5.5-7) that is deep, fertile and well-drained. Drainage is really important for successful paw-paw growth, as this tree will not grow well in wet soil. Paw-paws can grow in full sun to shade, but they produce more fruit in sunny conditions. At the end of August/beginning of September, paw-paw fruits ripen. The fruits are greenish-yellow and taste similar to a banana-mango mix. Generally, it takes a tree around 4-8 years to bear fruit. Paw-paws require cross pollination, so two plants are needed to produce fruit. Because some people suffer from paw-paw allergies, it’s best to only try a little at first. Paw-paw was one of George Washington’s preferred fruits, and Thomas Jefferson also grew several trees at his estate. Even Lewis and Clark enjoyed paw-paws during their travels. Paw-paw bark, leaves and twigs contain acetogenins, which make these parts distasteful to most deer, insects and rabbits. One exception is the zebra swallowtail whose caterpillar feeds upon the leaves. In the spring, adult zebra swallowtails can often be seen near paw-paw patches as they overwinter in chrysalises near their food plants. The fruits, however, are readily consumed by black bears, deer, foxes, opossums, raccoons and squirrels. Where, oh where is dear little Nellie? I love fall. As the days grow shorter and the temperature starts to dip, wildlife activity in the garden often intensifies. Animals that stay during the winter are busy caching food and fattening up, while others are fueling up to travel long distances to warmer climates. 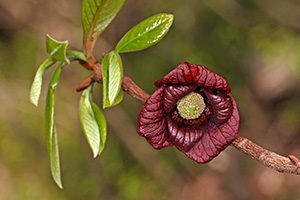 In this issue of HabiChat, we’ll focus on a native fruit tree known as the paw-paw, a favorite fruit of George Washington and an excellent food source for many mammals. In addition, you can learn about potter wasps and their unique nest structures that can be found around local gardens, as well as ways to bewitch local butterflies and moths (Lepidoptera) to overwinter in your yard. Finally, we have a quick list of common questions that often pop up in the fall. Click here to have HabiChat—the quarterly backyard wildlife habitat newsletter from the Wild Acres program—delivered right to your inbox!